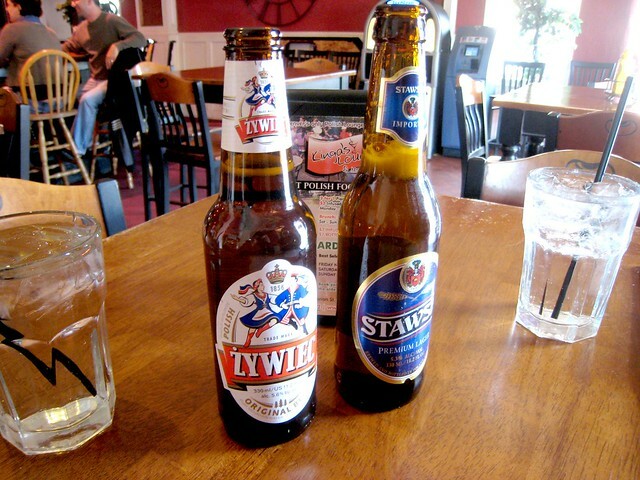 ES had never tried Polish food before, and when he picked me up from MC and ET's place in Denver one Friday evening, he suggested that we try Kinga's Lounge, located not far from their apartment. When we walked in we found a nearly empty dining room, which didn't seem to bode well. Still, it was the end of happy hour, and our two beers, above, were only four bucks a bottle. 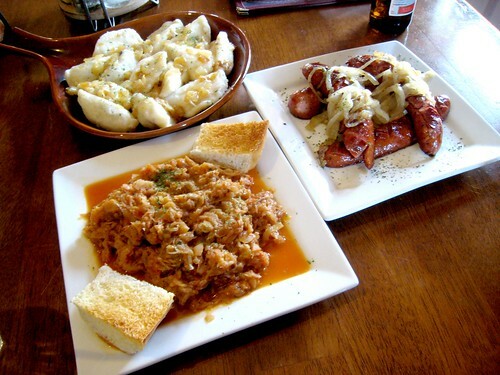 We started with two appetizers: bigos (described on the menu as "Polish national dish") and smoked kielbasa with caramelized onions. The former, while fine, wasn't the best rendition; it was watery and lacked the layered richness of stewed meat and sauerkraut that I was looking for. 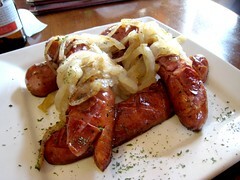 The kielbasa was better—splitting and grilling the sausage gave it a crackly skin that went well with the juicy meat inside. We decided to also take advantage of happy hour by getting two orders of assorted boiled pierogi—each one stuffed with either meat, potato, and cheese—for the price of one (shown above are both orders in one dish). Unfortunately, a double order of thick, gummy wrappers surrounding gluey fillings is not always the best deal. 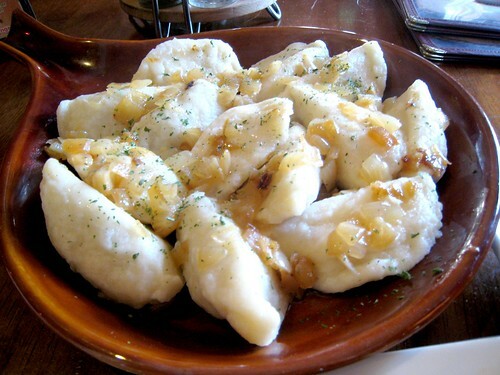 Aside from their leaden texture, however, the flavor of the pierogi were fine. I didn't end the meal completely dissatisfied, and in a city that seems to lack many other Polish restaurants, Kinga's Lounge might very well be your best bet. All the same, I'd be sad if this was ES's only experience with the cuisine. 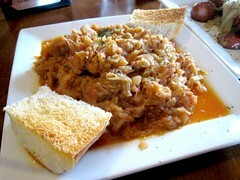 Suggestions, anyone, for a better Polish meal in Denver?